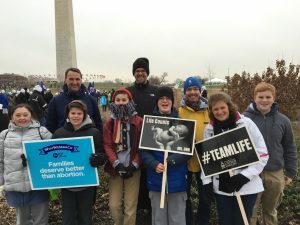 Year after year every January hundreds of thousands come to the nation’s capital to give a voice to those who do not have one—the unborn. Following the rally, more than a dozen from Holy Trinity and the Chapel joined His Beatitude Metropolitan Tikhon, head of the Orthodox Church in America, and several Orthodox hierarchs, clergy, and laity in praying for the victims of abortion, before making the two-mile trek from the White House to the Supreme Court. Holy Trinity’s support of life doesn’t end with this annual event. Throughout the year, our parish partners with the State College Pregnancy Resource Clinic to educate and encourage men and women to make informed life choices. View photographs of Holy Trinity’s and the Chapel’s participation in the March. View a time lapse of the approximately 500,000 people to attend the March. OCF members stand in support of children afflicted with cancer at the 2013 Penn State Dance Marathon. The group contributed $5,824 of the record $12.37 million raised this year. 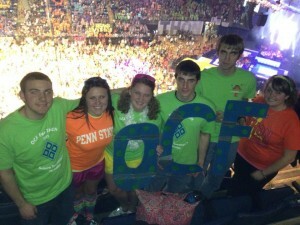 To see more pictures, visit OCF’s Facebook page. The Penn State Orthodox Christian Fellowship will travel to the storm-ravaged New Jersey coast this March 22-24 for a weekend of service and prayer. The group will depart Friday afternoon and spend Saturday participating in clothing and food drives for Sandy victims. Following a night of fellowship, the group will attend St. Demetrios Church in Wildwood before departing for home. The trip’s full cost is being underwritten by OCF and generous donors. 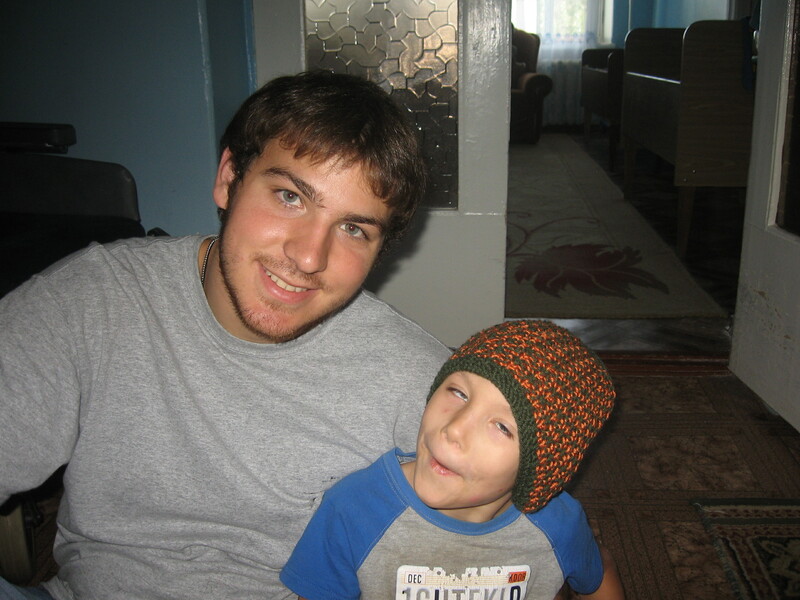 This June, OCF Treasurer Christopher McNulty will care for abandoned children suffering from cancers, birth defects, and other complications at two orph-anages in Ukraine. Donations for his mission are being accepted at holytrinity-oca.org/mission. Contributors will have an opportunity to learn more about his trip at a Lenten mission benefit luncheon to be held on Sunday, April 7 following Liturgy. Penn State Orthodox Christian Fellowship Treasurer Christopher McNulty will be returning to Ukraine on a mission trip hosted by the Ukrainian Orthodox Church of the USA. The trip takes place from May 30 to June 16, 2013. His mission team will serve in to two orphanages (in Puhachiv and Znamyanka) to help improve the facilities, to aid the staff, and most importantly, to help the mentally and physically disabled children in those orphanages. Christopher’s fundraising goal is $2,500, but any additional funds raised over this amount will go directly to the orphanages to help support their daily operating expenses. Every little bit helps! If you would like to give, Christopher and his family will be hosting a Lenten mission benefit luncheon to be held on Sunday, April 7 following the Divine Liturgy. Tax-deductible donations are now being electronically accepted through Holy Trinity’s PayPal site. The Penn State Orthodox Christian Fellowship will host two nationally recognized speakers this month. On Thursday, November 8 at their weekly 6 p.m. meeting on campus (212 Pasquerilla), Fr. Michael Ellis, OCF North American Chaplain, will speak to the group on “Coping with Scandal,” addressing the tumultuous events that have taken place at Penn State over the past year. Later that week, on Sunday, November 11, OCF will host renowned Palestinian activist Maria C. Khoury, Ed. D. Dr. Khoury—a human rights champion and author of several books and articles bringing international awareness to the dwindling Christian population on the West Bank—will speak to the entire State College community at 7 p.m. in 104 Thomas Building. A prolific speaker, Dr. Khoury is the wife of the mayor of Taybeh, the last remaining all-Christian village in Palestinian-occupied Israel. She was recently featured on a 60 Minutes episode highlighting her cause of improving living cond-itions for all those living behind a 430-mile long Israeli “security” wall, which critics have denounced as being akin to apartheid. Q&A will follow her presentation, which is open to the public. Dr. Maria Khoury speaks to CBS News’ Bob Simon during a recent 60 Minutes interview. UNIVERSITY PARK, PA – Renowned Palestinian activist Maria Khoury, Ed. D. will speak to the State College community on Sunday, November 11 at 7 p.m. in 104 Thomas Building on the Penn State campus. Dr. Khoury is a decorated human rights champion and the author of several books and articles that have brought international awareness to the dwindling Christian population on the West Bank, despite it being the birthplace of Jesus. She is also well known for writing the popular “Christina” children book series. Dr. Khoury is the wife of the mayor of Taybeh, the last remaining all-Christian village in the Palestinian occupied territories of Israel. She speaks from the perspective of being a woman, a mother, an Orthodox Christian, and a community builder with the specific purpose of improving living conditions for all those living behind a 430-mile long Israeli “security” wall, which critics have denounced as being akin to apartheid. A prolific speaker, Dr. Khoury was recently featured on a 60 Minutes episode highlighting her cause. Q&A will follow the presentation. Members of the Penn State Orthodox Christian Fellowship will enjoy a weekend of fellowship, learning, and prayer at St. Vladimir’s Seminary on October 5-7. There will be presentations, lectures, and discussion based on Orthodox Education Day’s theme of “Inklings of Glory: Godward Journeys with Lewis and Tolkien.” Participants will also enjoy an excursion to New York City during the three-day gathering. Penn State OCF will sponsor the cost of transportation, registration, and meals during the event; participants will simply need to bring spending money for the excursion. To register, email orthodox@psu.edu today.